Are you on a tight budget for fancy avocados and still haven’t made any “ethnic-looking” friends? 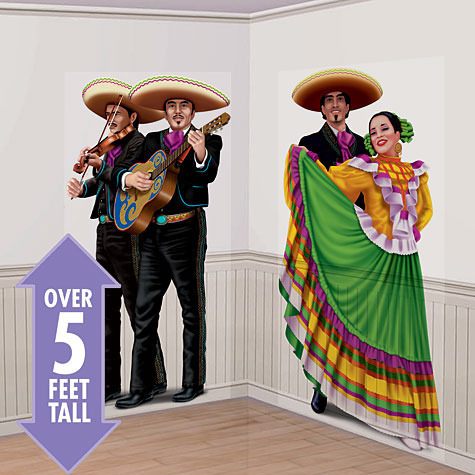 You can now buy 5-feet-tall Mexican “scene setters,” ready to assemble and give your Super Bowl party a unique fiesta touch. It’s as easy as bashing a piñata! For only a few bucks, you can pretend to have real Mexicans at your birthday, bautizo, quinceañera, wedding, etc. These Insta-Mexicans are over 5 feet high; they won’t eat all the tamales, nor gulp all the beer or crash in your living room forever. *I bet these are totally Made in China, but just pretend you didn’t read this note at all. This entry was posted in Latin America, Marketing & Advertising, Mexico and tagged Instant Mexicans, Mexican Party, Mexicans, Party City. Bookmark the permalink.